A Japanese space probe named after a falcon arrived at an asteroid 300 million kilometres from Earth on Wednesday after a three-and-a half year journey on a mission to seek the origins of life. 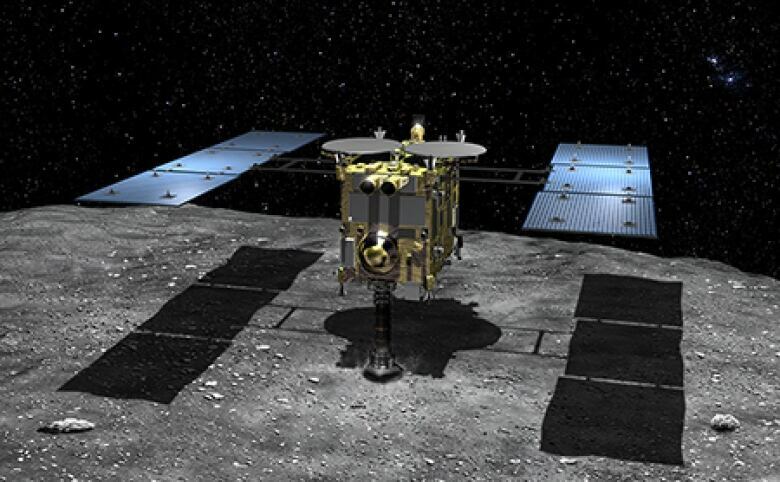 The Hayabusa 2 blasted off in December 2014 for the asteroid Ryugu on a pioneering mission to take samples that scientists hope will help reveal how life began. Its round-trip mission is set to take six years. Hayabusa 2, named for the peregrine falcon, will spend the next few months orbiting about 20 km above the asteroid and mapping its surface before landing. It will then use small explosives to blast a crater on the surface and collect the resulting debris. Asteroids are believed to have formed at the dawn of the solar system and scientists say Ryugu may contain organic matter that may have contributed to life on Earth. Television footage showed the control room erupting in applause as the probe’s safe arrival was confirmed, with some researchers standing and grinning as they shook hands. “We’re mostly relieved, but now there’s tension as to whether the main mission will go well,” one official said. Should all go according to plan, Hayabusa 2 is expected to spend around 18 months near the asteroid and return to Earth with samples at the end of 2020, the year Tokyo hosts the Summer Olympic Games. The first Hayabusa probe was unable to collect as much material as hoped but still made history by being the first probe to bring back samples from a different asteroid. Its seven-year mission ended in 2010 when it blazed a trail over Australia before slamming into the desert. Success with Hayabusa 2 would help Japan’s space programme move beyond a chequered past that included a 2016 accident in which the first of three planned military communication satellites was crushed during a flight from Japan to Europe’s space port in French Guiana. The first such satellite eventually blasted successfully into space in January 2017.